This entry was posted on January 20, 2016 by Van Rental. Only a few days ago, I questioned why mainstream van manufacturers were not producing hybrids, given the proven fuel savings and emission reductions of such systems. I cited the 7.5t Fuso Canter Eco Hybrid as an example of what’s possible. Just a few days later, news has reached me of a British company that’s taken a different approach to hybrid technology. 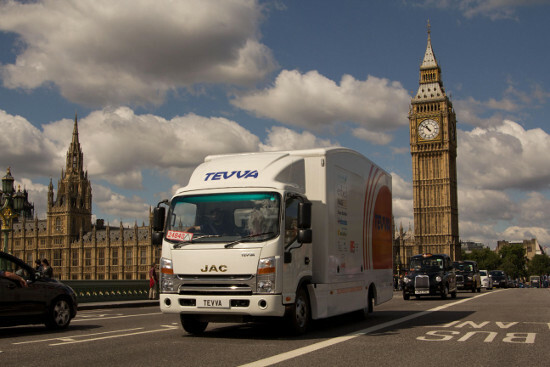 Tevva Motors is developing an electric range extender powertrain that can be fitted to new or existing 7.5t trucks. What’s a range extender? The idea behind a range extender is that the vehicle is driven by its electric powertrain at all times. However, range extender vehicles also have a small petrol or diesel engine which is used as a generator to provide electric power when the batteries are unable to cope or need charging. This effectively means that the range of the vehicle is unlimited, subject to refuelling stops. It doesn’t need recharging during longer journeys. The best-known example of this approach is probably the Vauxhall Ampera car (also sold as the Chevrolet Volt). This has been in production for a few years now, but failed to sell well in Europe and was withdrawn from General Motor’s European ranges last year (it’s still available in the USA). How’s it different to a hybrid? In a hybrid, the vehicle is directly powered by both its internal combustion engine and its electric motor. At times it may run on electric power alone, or on the internal combustion engine alone, but both have direct drive to the wheels and operate semi-independently. What’s Tevva doing? Tevva has developed an electric range extended truck and currently has three vehicles in operation, including one with logistics giant UPS. The firm is developing models for full-scale production in the next three years, and is also developing its range-extending electric powertrain as an aftermarket solution which can be retrofitted into older trucks. A feature of the Tevva solution is the firm’s predictive software, which maximises use of electric-only power in urban environments and other situations where air and noise pollution is a particular issue. The system has real-time access to NOx and air quality data and combines this with GPS navigation to optimise use of the range extender. For example, on a journey incorporating urban roads and motorway, the Tevva system might decide to use the diesel engine on the motorway in order to ensure that there is enough battery power left to complete the urban sections of the journey under electric power. Asher Bennett, Tevva Motors CEO, commented: “Our technology and design offers all of the benefits of an electric vehicle, meeting the environmental needs of modern legislation and social acceptance, without the drawbacks of limited range. As Mr Bennett comments, the key benefit of range extenders is that they make electric vehicles much more widely usable. Technical details: The Tevva truck can manage 100 miles on electric power, although this will vary with driving conditions, load and driving style. The range extender extends this range to 250 miles with a 40l fuel tank or 370 miles with a larger 75l fuel tank — although of course you can refuel can carry on driving as long as you need, using the range extender engine. The powertrain is made up of a 120kW (161hp) electric motor with a 350V/66kWh battery pack that’s expected to last 7-10 years, or 2,000 charging cycles. A 1.6-litre diesel range extender engine is recommended and a regenerative braking system is also fitted to maximise battery life. Charging requires a 3-phase, 32A supply and takes up to three hours. Tevva says that greenhouse gas emissions from the range extender with predictive technology are typically 80% lower than from an average diesel-engined 7.5t truck. Pollution from NOx emissions, a common cause of respiratory problems, is 50% lower than with a Euro 6 approved 7.5t truck, according to Tevva. Our view: Tevva’s goal is to gain a foothold in the low emission truck market by supplying their own trucks, which are based on an existing model from Chinese firm JAC. Tevva also plans to make the range extender system available as a kit which can be retrofitted to existing trucks. UPS’s willingness to put the Tevva system into daily use suggests the product is credible and usable, so it will be interesting to see where this leads. I can’t believe it will be too much longer before more major van and truck manufacturers start producing hybrid models. When so many CVs are used for limited mileage and in urban environments, it is surely hard to ignore the environmental benefits of such technology.